Last night I went out to see the sunset and grab a beer with friends. We settled down just before sunset at SkidRow, a local restaurant/bar. We pulled two tables together and each made our place to our seats. Conversations ranged from mothering to cleaning up the beaches to island conflicts to photography. As I looked around all of us girls were expats and each has their own unique story of how they made it to the island and what makes them stay. Before long, an older gentleman made his way to our combined tables and pulled up a chair. Several of the girls greeted him and then introduced the newcomers. Doc Rail. Funny, I had just heard his name the previous night from an island friend who said her dad had worked for Doc Rail when he was a kid. Actually the story was more interesting than just that. Her dad had left the island in his teens to go work for Doc Rail. Doc had a unique career going in the States. He organized and put on water skiing shows. The kind of shows with girls formed as pyramids as they cut through the waters. I’ve never actually seen one of those shows. I don’t even know if they even have that kind of thing anymore. But in the 70’s it was big entertainment. So, within seconds of being introduced to Doc last night, he grabbed his chair and pulled it right up next to me. He had a knife in his hand and about 8 stems from a palm branch. He wasn’t holding a beer or a wallet or an iPhone. I immediately noticed his beautiful hat “Korean Veteran” and thanked him for serving our country. He dismissed the compliment by saying he was drafted. I repeated my gratefulness and left it alone. 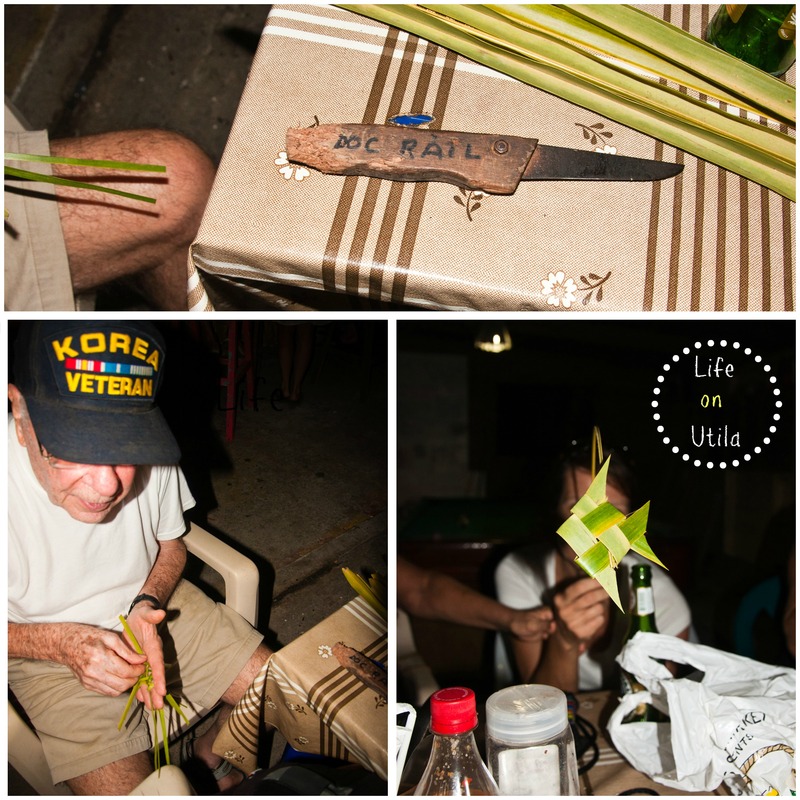 Doc and I engaged in conversation for over an hour, all the while he was whittling away with the knife and palm branch stems. He asked if I wanted a bird? I said absolutely. Not only did he make me a little bird, but when I left SkidRow I had a parrot fish and an angel fish. When I asked him if he charged for his craft. He laughed. It was like he was offended at the idea because he loves to do it and he enjoys conversing with people while he does it. I heard later that he regularly visits the bars and restaurants looking for newcomers to chat with and make them his beautiful handcrafted birds and fish. Thank you Doc Rail for your kindness and creations! Great photos and colorful nickname for a Utila expat. Yes Doc is a very colorful person. I worked for him from 1968 to 1973. He organized ski shows for a marine world in Galveston, Texas and for very special and challenging ski shows in a hotel swimming pool in Houston, Texas! So glad to see he is doing well! Ginny, he loved telling me about the shows he used to put on! How fun that you were a part of that! I am not living there anymore, but that’s great you know him and skied in his shows! Cheers and thanks for reading! Hope he is still alive… Thanks for getting back with me… Both my children have lived there and have been scuba instructors not knowing Doc was there… What a character. Sadly he just passed away this week. He lived a life many of us could only read about in books. RIP Doc. Oh I’m sorry to hear that. Thank you letting me know. He was indeed a unique man. Sadly he passed away this week. He was a kind man that led a life worthy of a book. RIP Doc. Hi Jill, I was just back in Nassau Bay TX after more than 40 years and it made me think of my water skiing days with Doc Rail. A little googling and I found your article. Thank you! He taught me everything I know about skiing, driving boats and being part of a team. I am one of those girls in pyramids. In a tutu no less. We also skied 7 in a line holding the ropes with our feet. And I was a ski jumper and slalom competitor and did a very little bit on trick skis and one time flew up in the kite. Fell out of that pretty quickly. We skied year round wearing wetsuits in the winter and taking off from the ski hut ramp and landing back on it dry as a bone. I was very proud of my custom made Rail sky. In some Houston TV station’s archive someplace there may even be footage of shows we put on in the Nassau Bay and once in Galveston bay that the news folks came out and filmed – and put on TV! I have wondered many times whatever became of Doc. I am so happy he lived such a long life and ended it perfectly in paradise. Thank you, Betsy R.
Something steered me here today to see if Doc Rail was still living. I’m so sorry I waited too long. I only met Doc once, but somehow I kept “just missing” him since I first heard his name in 1963. I was 18 and working my first job as the receptionist at the downtown Houston Oshman’s store. I was engaged to a guy who was a ski fanatic. All he could talk about was his custom slalom ski and the man who made it…Doc Rail. Our engagement didn’t last, but the name Doc Rail wasn’t so common that I would forget it when a man came to Oshman’s to build a pool table for an upcoming exhibition by Minnesota Fats. The man was Doc Rail. All week I got to watch him build it. I even was called upon to drive him home one day. It seems like he and his family lived in Glenbrook Valley, or at least somewhere near there. I lived nearby myself. Several years later I was working for Philco near NASA, and at happy hour one afternoon at the King’s Inn a friend was wearing a woven hat when I walked in. She said that a really nice guy named Doc Rail had just made it for her, but he was gone by then. I hope one day I’ll know why he was skirting my life in various ways. For someone I hardly knew, he made quite an impression on me. Rest in peace, Doc.